Red Gate Software and SQLServerCentral.com will be one of the sponsors for the upcoming SQL Server 2012 & SharePoint Connections to be held in Kongresshaus Berchtesgaden, Germany, May 8-9, 2012. The SQL Server 2012 and SharePoint Connections conference agenda brings together more than 40 top-ranking experts from Microsoft, along with leading independent presenters to deliver in-depth sessions on how to succeed with SharePoint and SQL Server based on real life production deployments with the latest hot news from Microsoft’s biggest launch this year for SQL Server 2012. According to those DBAs who responded to the poll, about 60% of them said they didn’t know transaction logs could be tuned. 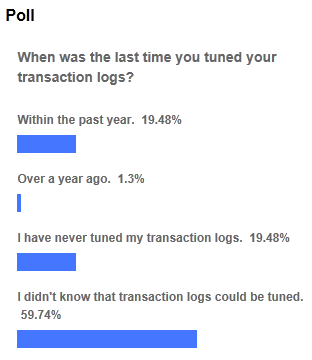 And just over 19% said they have never tuned their transaction logs. Sadly, only about 21% said they have tuned their transaction logs in the past. If you are one of those DBAs who don’t know transaction logs can be tuned, you need to take the time as soon as possible to learn about this topic.Why? First, every data modification made in SQL Server must be logged. Second, no transaction can complete until all of the related data modification are written to the transaction log. And third, writing to a transaction log is a single thread process. On a busy SQL Server instance, writing to the transaction log can become a bottleneck, preventing transactions from being completed on a timely basis, slowing down the entire instance. There are many ways to tune a transaction log, some very simple, and others slightly more complicated, but it is not beyond the ability of most DBAs. To learn more about transaction log performance tuning, download my presentation slides on “Inside the SQL Server Transaction Log”, which will give you a good start on learning the basics of this important topic. Reprinted from my editorial in Database Weekly. I know a lot of DBAs who make SQL Server the focus of their life. In many ways, if you want to be an exceptional DBA, and stand out from the crowd, you don’t have a lot of choice about devoting a lot of time to your career. There are many reasons for this. For example, the nature of the DBA’s job often requires working long hours, working weekends, and being on call 24/7. Then there is the need to continually increase your knowledge, especially as SQL Server continues to become more bloated with features with every new release. And if you are involved in volunteering for the SQL Server community, time commitments can be huge. Recently, I was doing some testing/playing around on a particular database on my home test servers. 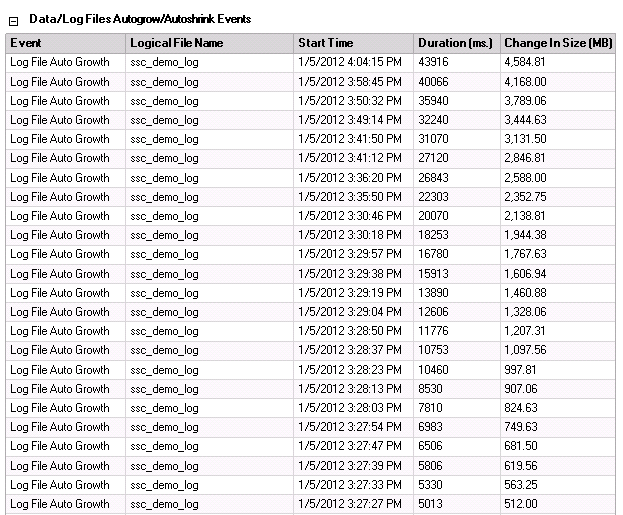 After I was done, I checked out the “Data/Log Files Autogrowth/Autoshrink” portion of the “Disk Usage” report for the database, which is shown below. While I might expect to see results like this on a test box, I would be mortified if I saw it on a production box. As a small challenge to your SQL Server administration skills, just by looking at the above data, what can you deduce it? What do you think is going on, and why, and how might it affect the databases’ performance? In addition, what might you do to prevent the problem in the first place? Let’s see who can come up with the best explanation. Please post your responses below. PS: If you are not familiar with this report, I suggest you learn more about it. It is available from SSMS by right-clicking on a database, and then selecting Reports | Standard Reports | Disk Usage. Such a simple report can make it easy to identify some specific database configuration problems, as demonstrated in the example above.